Did you know that Jesus was praying for you before you believed and long before you were born? Jesus prayed for all believers that would ever be (17:20-26). He prays that you would be protected from the evil in the world, you cannot escape it but you do not have to conform to the way the world lives. Jesus has already prayed the power over you that protects you from following evil desires. If you struggle with sin or temptation, be assured that Jesus prayed the power to break any hold it has over you more than 2000 years ago. He was praying for his relationship with you whilst he was still here on earth and he continues to pray for you now (Romans 8:34). Jesus knows that life is not easy and he knows, especially as Christians, we will have troubles in this world, but he reassures us he has overcome the world (16:33). There is nothing bigger than God, there is no problem that will overwhelm you, and nothing you cannot get through without his help. I love the saying "Don't tell God how big your problems are, tell your problems how big your God is". God promises this to Israel in Isaiah and that promise remains for you today. Jesus prays for God's protection over you (17:11 & 15), but more than that he prays that God will sanctify you. Before you were born you were chosen and you have been sanctified by truth. 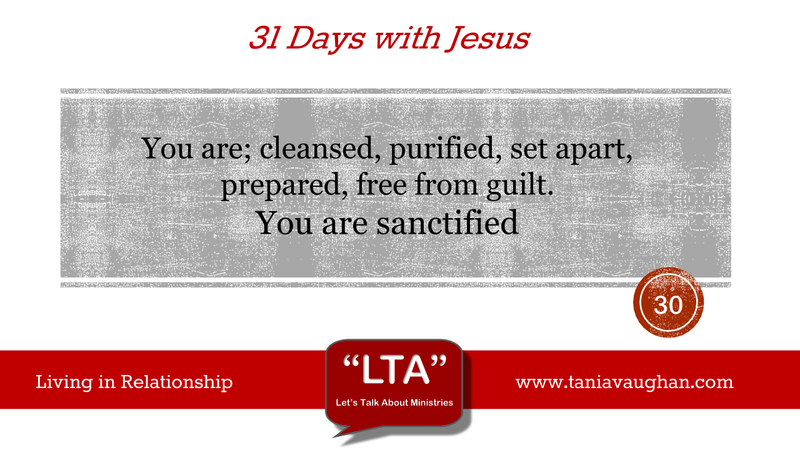 Websters dictionary says that sanctify means; cleansed, purified, set apart for a holy use, prepared and free from guilt. They are the words and promises that have been prayed over you and continue to be prayed over you by Jesus. These are the words that describe you in your relationship with Jesus. Read those words again and before each word say "I am". Paul encouraged the Thessalonians with the same promises so they too would know how loved they were. Stand firm in your relationship with God through Jesus and hold on to these words and promises when trial and difficulty threaten. Lord, thank you that before I was born, before you even died for me you were praying for me. Thank you that you continue to pray for me now and that I am under your protection. Help me to see the smallness of my difficulties behind the enormity of you. We all face temptations in live. From chocolate and cigarettes to gambling and alcohol but we have been given the power to overcome it. JC was tempted by the devil for 40 days - he was no stranger to temptation either. God knows the trials that we will face and, as we see here, JC has been praying for us since before we were even born! Think about that for a bit! Before we even encounter any problems or temptations JC had our back and was interceding for us with the Father. This has been a big deal.for me. I have struggled with specific temptations for a long time; but it wasn't until I left it all at the foot of the cross and stepped back for Jesus to do his thing that I found the strength to resist it and for me to control it and not for it to control me. To be sanctified is a wonderful gift. To know forgiveness and therefore purity through his sacrifice is humbling. To know this was achieved by a blameless lamb and to know we can never repay him is even more astonishing - grace is defined as 'the free and UNMERITED favour of God'. Solely so we can be in relationship with him. Wow! I am so thankful that Jesus goes to the Father on my behalf, standing in the gap for my needs. Thank you for sharing at The Weekend Brew!